This software utility helps find and highlight words in MS Word documents. Batch Word Highlighter highlights one or more words in one or more Word documents. It will highlight and format background color, foreground color, bold, italic, underline and strike through words and text in Word documents. Each word could be highlighted in a different format. Several improvements have been incorporated in the current version. These include Unicode compatibility. The tool has a built-in color picker. The formatting has been made easier. The interface is not really very simple. I is actually quite intuitive and fairly easy to grasp what’s to be done and how. The interface helps create a batch list quickly and easily. File types that you could use include DOC, DOCX and RTF. For starting the highlighting process, you start by pressing add word button and enter the words one by one. The target words could be imported through a fie too. You could start the process after you have decided about the formatting you want to use when the words are found. The output folder is the native folder by default, you could specify one too. Match case and match whole words are two options available. Using bold, Italic, Underline and Strikeout any word in documents containing just about any language is possible. The tool is compatible with UTF-8 as well as Unicode. Files are automatically backed up to keep the process safe. A log file shows all the processing details for subsequent analysis. These are useful when there is some problem in the processing. This is a very useful tool when you have a bunch of Word files are to be processed. Batch Word Highlighter is an useful tool for highlighting multiple words in multiple doc files, you can format backcolor, forecolor, bold, italic, underline and strikethrough any word or text in any word document. You can highlight each word with a different format. The new version is more efficient and easy to use, we fixed many bugs and intruduced new features like Unicode Support, builtin color picker and made formatting easy, this version is more user friendly with Step wise processing. • It can HIGHLIGHT multiple words in multiple doc files. • You can highlight each word with different format. • Support UTF-8/ Unicode Files. • You can even highlight words in all languages. • You can use Match Case and Whole Word options. • Step wise processing for easy navigation. • Instant formatting with mouseclick. • Processing with backup of your files. • Processing in same folder or in a separate folder. 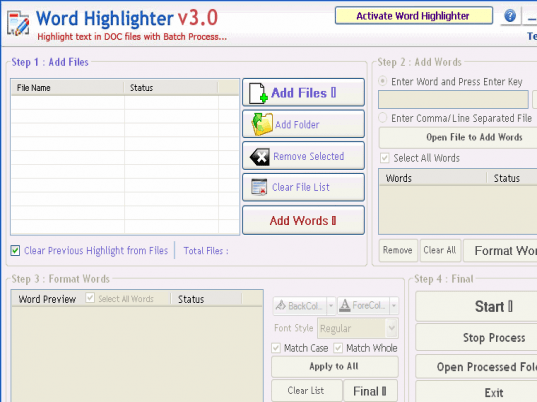 • Word Highlighter Tool Processes thousands of files in a short time. • Log file to show all the processing details for easy analysis. • Most fast, accurate and reliable. • Supports All Languages like Chinese, Japanese, Spanish, Korean, French, German, Italian, Arabic, Hindi, Farsi, Thai, Russian,Vietnamese, Greek, Hebrew, Tagalog, Indonesian, Norwegian, Portuguese, Cambodian, etc.